Welcome, and if you're visiting from Alycia's blog, I'm glad you're here! 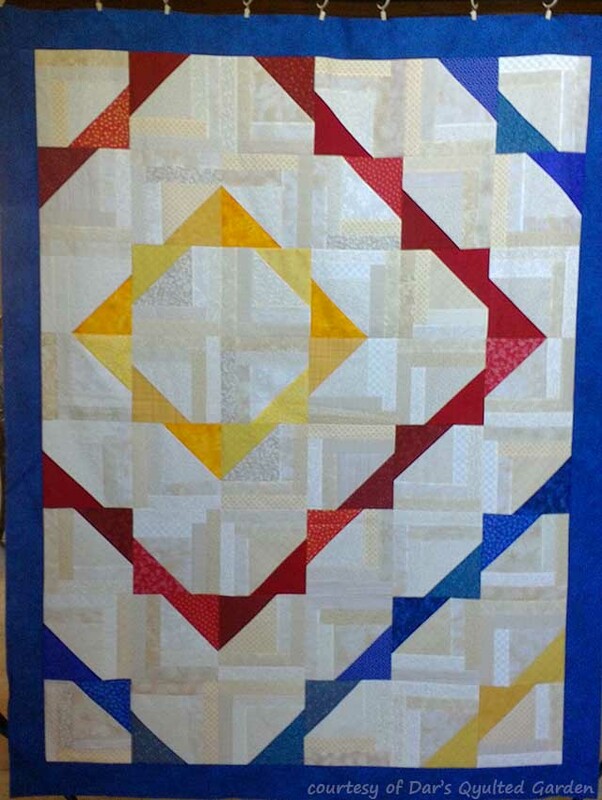 Earlier this summer I made a block I called Log Cabin Triangles. It turned out to be fun and versatile. And it's kind of addictive to make! It would look great made up in patriotic colors so I offered it to Alycia for a block drive, she accepted, and here we are. Other regional QOV groups are welcome to use these blocks, too. We'll start with the tutorial for the block, which actually makes two blocks at a time. Then I'll give you the layout I gave to Alycia and show you some versions my St. Louis QOV friends made. I'll finish up by showing you the top I made; I couldn't resist making a few more blocks. I hope this generates lots of blocks for Alycia's block drive! Skill Level: Easy. A beginner with just a little experience with 1/4" seams and half square triangles was able to successfully make these blocks. Block finishes at 9" (9-1/2" unfinished). Materials and instructions are to make two blocks. All seams 1/4". 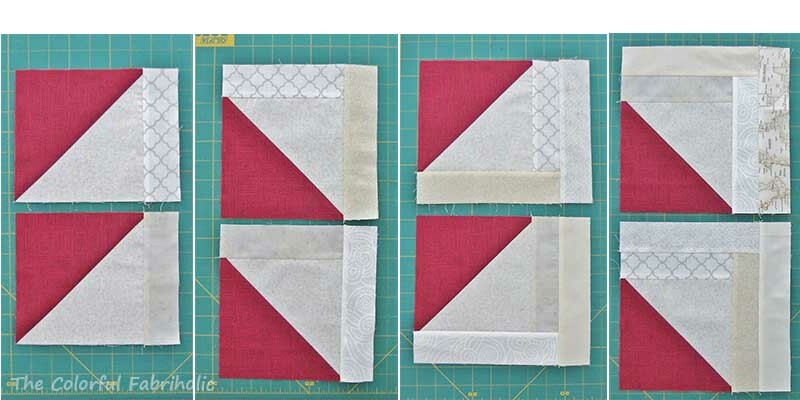 Make blocks as scrappy as possible. a. Mark the pale square on the diagonal on the wrong side. b. 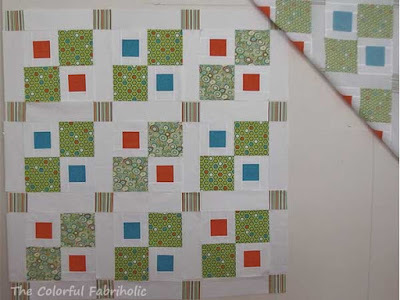 Place colored and pale squares right sides together and stitch a scant 1/4" on each side of the marked line. c. Cut on the marked line. d. Open and press seam allowance toward the dark fabric. e. Square up and trim to 6-1/2". 2) Add logs; chain piecing works well. Finger press each round outward before adding the next log. a. 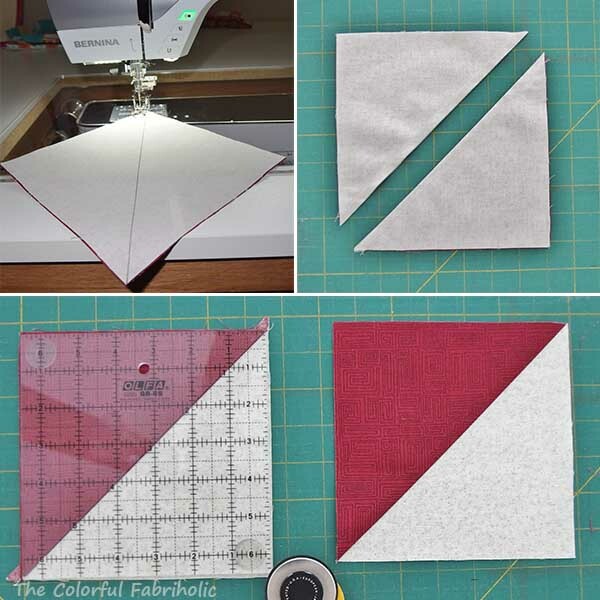 With the HST colored portion in the upper left, place a 6-1/2" strip along the right side and stitch, using a 1/4" seam. b. Rotate the unit so the colored portion is in the lower left. 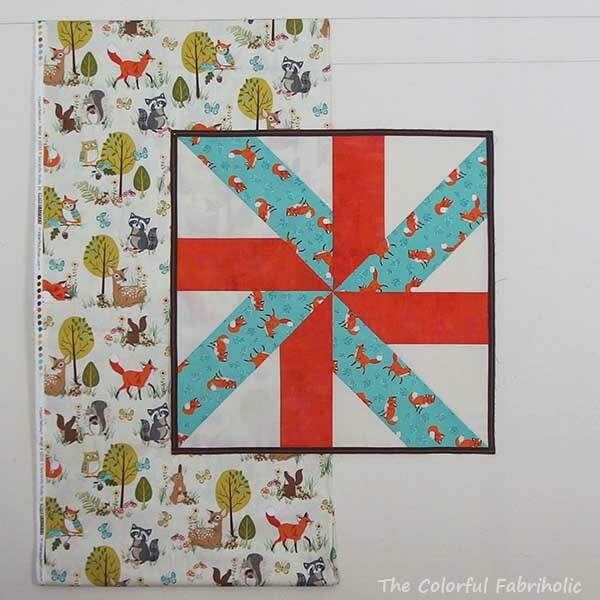 Place an 8" strip along the right side and stitch. c. Go back to the first side and add another 8" strip. d. Rotate to the second side and add a 9-1/2" strip. You now have two completed blocks. Here is a basic layout, 6 blocks wide by 8 blocks long (54" by 72") which will allow room for borders if desired. 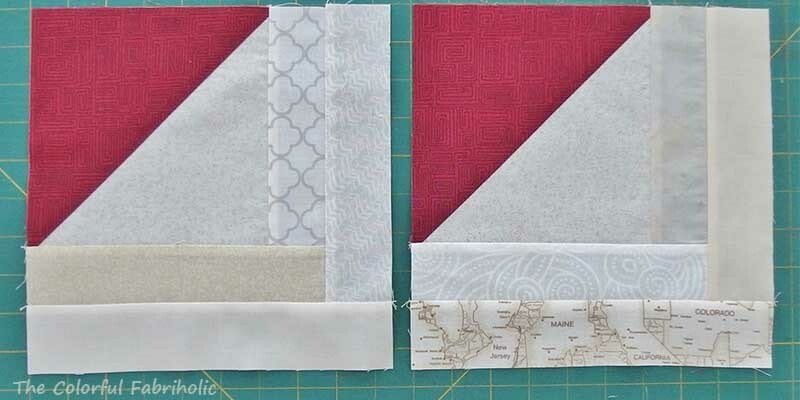 If you add 3" wide borders all around, it would finish at 60" by 78". My friend Gwen heads up a small group of quilters who work at Scottrade St. Louis who make Quilts of Valor with the approval and sponsorship of Scottrade. 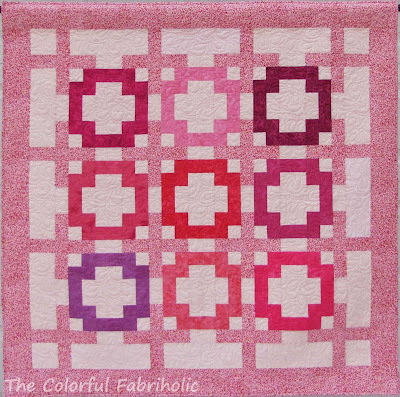 I joined them for a sew day recently to test out the block pattern, and it turned out great. They were so enthused they got together again the very next week to make enough more blocks to finish their top. As I mentioned, these blocks can be addictive, and I got a little carried away. I made a top with extra blocks, no borders, in the modern style. I added one more column to the right and one more row to the bottom, so my top finishes at 63" by 81". So I hope you'll make some LCT blocks for QOV. Details about Alycia's block drive can be found on her blog here. I hope this tutorial helps generate blocks for Alycia's block drive and for any other QOV groups who'd like to use these blocks. A local shop just finished up a BOM series with a Roman Road theme, a color palette of stone & brick. Each month there was a main block, left, and an alternate block, shown in it's original version at right. My friend Cherie suggested a variation that would mean fewer seam matches. 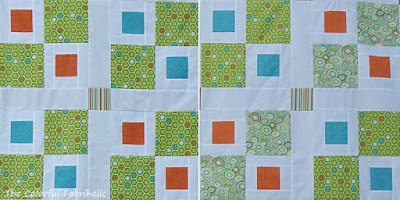 She changed the four-bar side units of the alternate block to three bars. I mocked it up in EQ for her and we both liked the change. So I took apart my alternate blocks, set the parts aside, and made all new side units. I had the pleasure of going to camp over this past weekend (private retreat). The opportunity to go came up very suddenly, with no time for me to plan or prep projects. I grabbed the secret sewing and Roman Road, hoping they would keep me busy. - Alternate blocks: have 4 untouched kits, 8 partially assembled (previously completed and taken apart) blocks. Have 48 replacement side units ready. - One additional Main block is completed. - 12 alternate blocks were assembled with replacement side units. Some had to be made from scratch and some had to be reassembled. - Borders are planned. Alternate blocks were revised accordingly which meant eight of them were taken apart again and reassembled again with white on the outsides. - Blocks were laid out for placement. - Blocks were sewn into rows. Then directional alternate blocks were discovered with centers going the wrong way, so the rows had to be taken apart, blocks turned or moved, and rows reassembled. In the photo above, I see one more alternate block turned the wrong way, so I'll have to rip it and fix it. I swear, I have never used a seam ripper so much in one weekend or on one project as I did here. It's a wonder there's anything left of some of those seams, they've been ripped and resewn so many times! But I'm pleased to have Roman Road so far along. I'll fix the turned block and prep the borders, then pack up this project and have it ready to work on at a different retreat in October. Also this weekend, I was able to assemble blocks into a top for my secret sewing project, a collaboration with Alycia. All I can say is "Wow." The reveal will be Wednesday, so go visit Alycia on Wednesday, then come back here. August was a good month, with way more out than in. I'm ahead big time for the year, Whoo-hoo! So if I buy a bit of fabric here or there, it's all okay. 1. 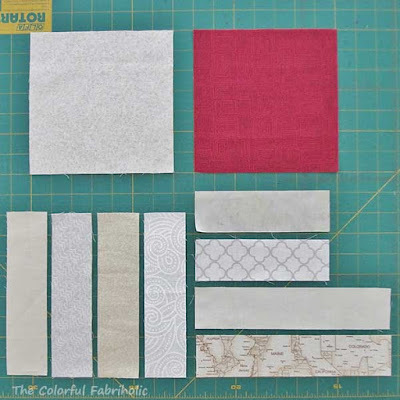 Bind, label, and add sleeve to Paussietivity & deliver to LQS for class sample by Aug 5. DONE. 2. Work on secret project, collaboration w/ Alycia, to be ready to post by Sept 1. Blocks all done, flimsy in work, block instructions written. 3. 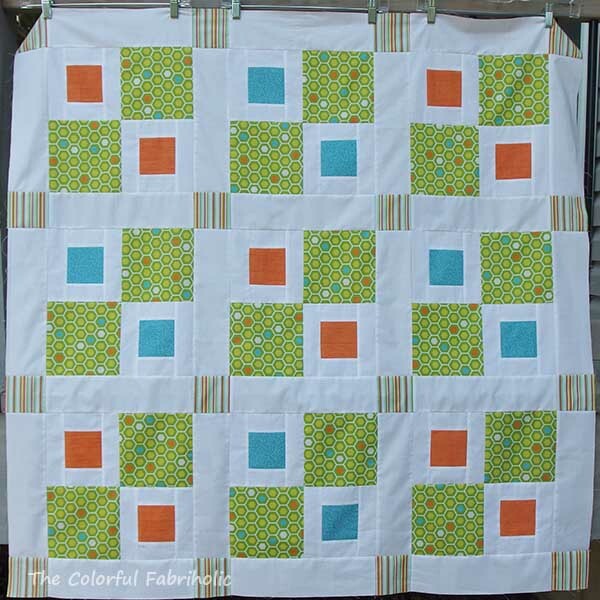 Finish Laurie's baby quilt top. DONE and quilted, ready for binding. 4. Make top for Heart Builders for My Stuff Bag (from Stash Builder Box). DONE; ended up making two tops. 5. Keep up with bee blocks. Umm… missed meeting for one of them and the other is still in work, due Sept. 6. It feels good to be back to blogging. I took a couple weeks off, mostly because DH and I were on vacation in the Seattle area for nine days. We had a great time, and had really good sunny weather except for one day. Now that I'm back and I've unpacked and done laundry, I've finally been able to get back into the sewing room. I started the quilting on the Forest Fellows baby quilt before I left, and got it finished and ready for binding since I've been home. 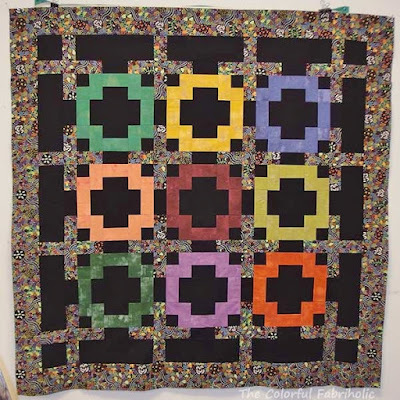 Due to the piping, the center poufed up a bit, so I quilted the center more densely than the border, and it flattened out nicely. 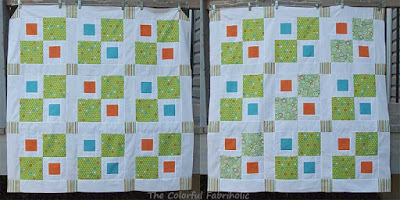 With my limited FMQ skills, I quilted stippling in the ecru, small meander in the turq, matchstick straight lines in the orange, and large meander in the border. The backing is a single piece of that large Forest Fellows print. 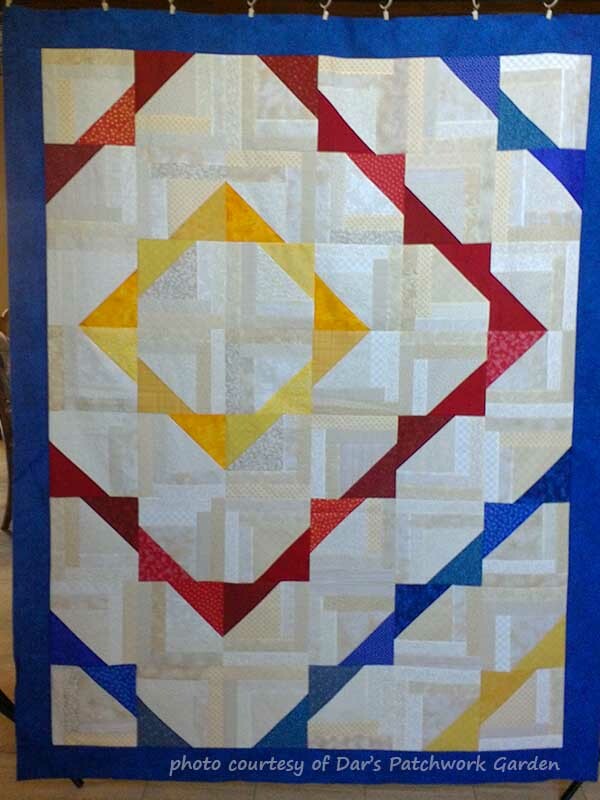 Trimmed and ready for binding, this quilt measures 41-3/4" square. How's that for fitting it into one WOF piece of backing?! I'll bind it in the same brown as the piping. Binding will have to wait a bit, though. I want to put the baby's name on the label and insert the label into the binding. I'll have an opportunity to see the parents and confirm the baby's name over Labor Day weekend. No surprise, they know I'll make a quilt for this baby since I made quilts for their other two. 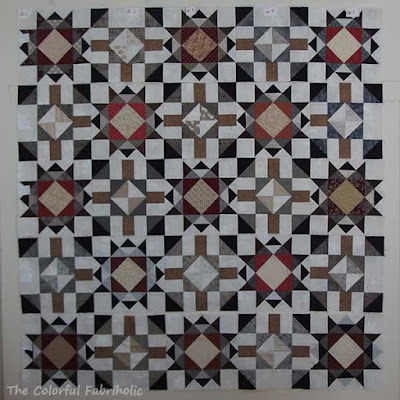 Since getting this quilt finished was my OMG for August, I'm linking up with Red Letter Quilts. It's as finished as it can be until I verify the baby's name. In other quilty news, I've been invited to camp again this weekend (private retreat). Since I'm totally unprepared, I'm packing my big deadline project and throwing in some UFOs as well. I'm also taking my laptop so I can write the instructions for the big deadline project and have them ready to post when the time comes. Hint: I'm collaborating on something with Alycia. So as well as some finishes, I've got a busy day and a fun weekend ahead of me. Whoo-hoo! I'm linking up with Sarah over at Concessions of a Fabric Addict. Check out what everyone else is celebrating over there. Not one but two tops finished for Heart Builders - Whoo-hoo! They're not quite twins, but definitely siblings. Maybe they'll go to siblings in need? 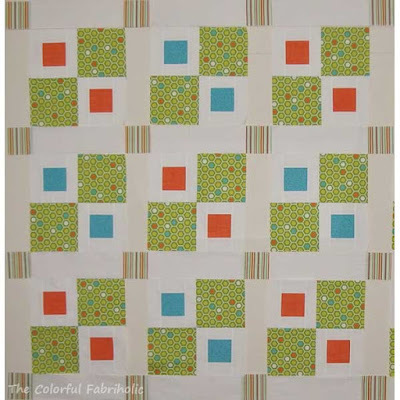 After my mix-up with the measurements, I was able to make one top with nine of the original blocks, and I had seven blocks left over. So I made a second top using a harmonious print that I found in my stash. Heart builders originally sent me a yard of the green print and a yard of white. 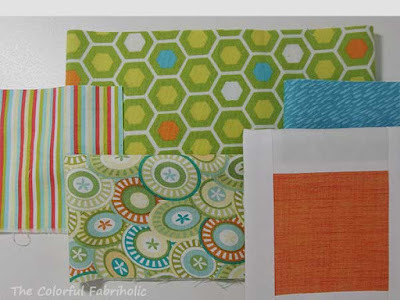 To that I added 2-1/8 yards of my own white, 1/4 yard each of my own orange and turquoise, 3/8 yard of stripe, and 1/4 yard of the extra green print, for a total of 3-1/4 yards of my own stash used. So these are ready to be mailed back to Heart Builders. This was fun, and I hope they'll keep me in mind next time they need a top (or two!) pieced. Linking up with Whoop Whoop Friday at Confessions of a Fabric Addict. PS - I have some family and personal stuff going on and some secret sewing that has to be done for a deadline. I'm going to take a little break from the computer for a while. I spend far too much time on it, and I need to concentrate on other priorities. I'll be back by the end of the month and I hope to have some fun stuff to share when the time comes. 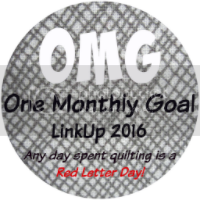 I admit, I've been procrastinating on this one, even though it's my One Monthly Goal priority goal for August. I'm kind of winging it, figuring it out as I go along, and the borders had me a bit anxious. Thank goodness for deadlines! I couldn't put this off any longer. Voila, borders are on! Because of the scale of the print, I didn't want to chop it up any more than necessary. 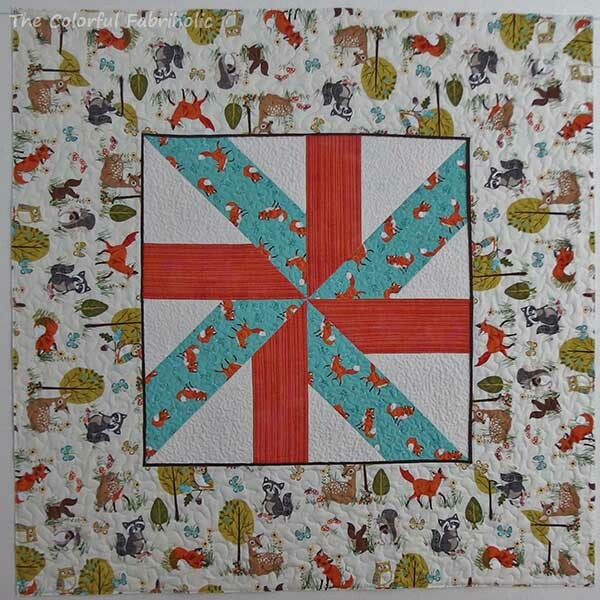 I also wanted the animals to be right side up facing out around the edges, so I needed to miter the borders. I wanted the borders to be as wide as possible using the full WOF. So I looked carefully at the print repeat and cut 12" strips. I discovered that I had two pairs of matching prints: note the fox near the orange in the top & bottom border; he's near the turq in the side borders. 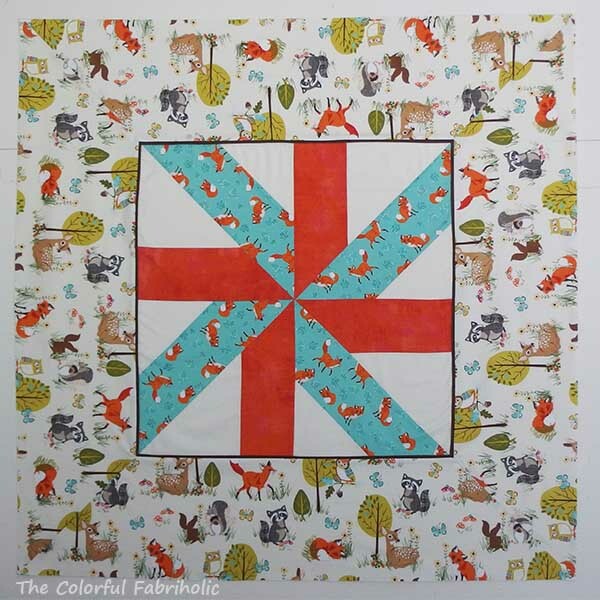 12" would be too wide to actually miter the corners, and would make the quilt too wide, so I trimmed the border strips down to about 10-1/2", keeping the most important elements of the print from being cut off too much. I attached the side borders, then the top & bottom, then mitered the corners. 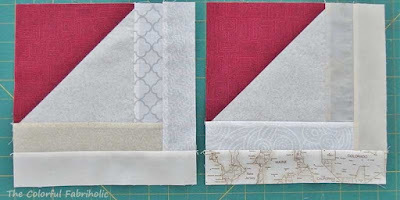 The borders were still too wide - I had nearly an inch beyond the miter seam - so I knew I needed to trim down the overall size. By trimming the borders to 9", the corners came out okay and the overall size of the quilt is 41" square. 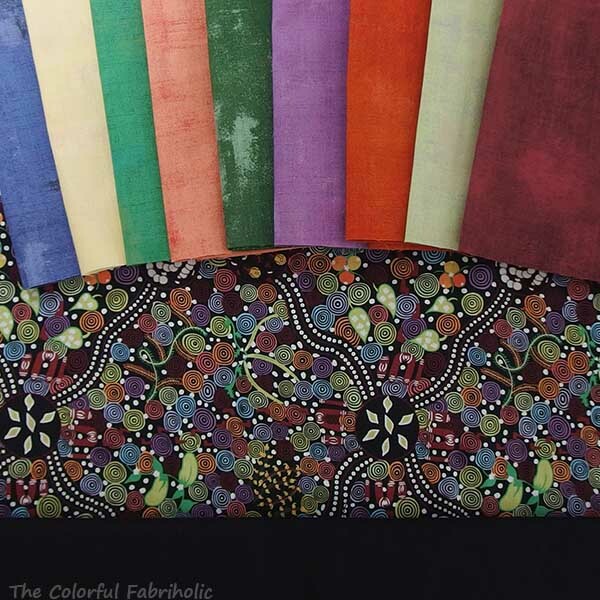 I'm planning to use more of the focus fabric for the backing, and it's is 42" wide including the selvages, so I'm going to try to use it for the back without any piecing. Wish me luck! This was trial and error all the way. It's probably the waviest and wonkiest but still square quilt top I've ever made. The piping (flange) around the center seems to have drawn up a little, and it certainly didn't make mitering the corners any easier, so I would not recommend it. I hope it's true what they say, "It'll quilt out." 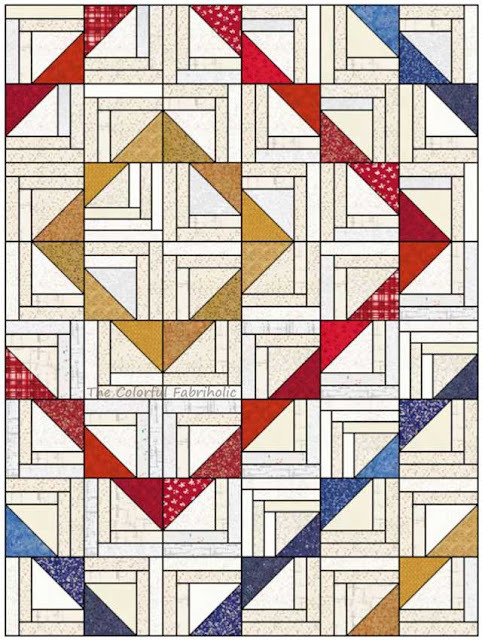 I'll quilt this one myself with meandering in the borders and small stipple and some straight lines in the blocks. I'll quilt more densely in the areas I need to shrink up a bit. Hopefully that'll make the whole thing lay flat. I'm going to have to pin this one pretty densely to avoid puckers. 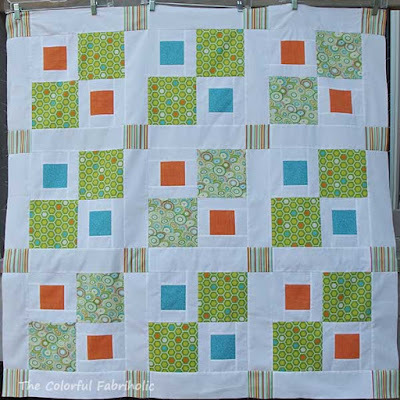 I don't think baby and mom will be too picky about the quilting or any residual wonkiness. 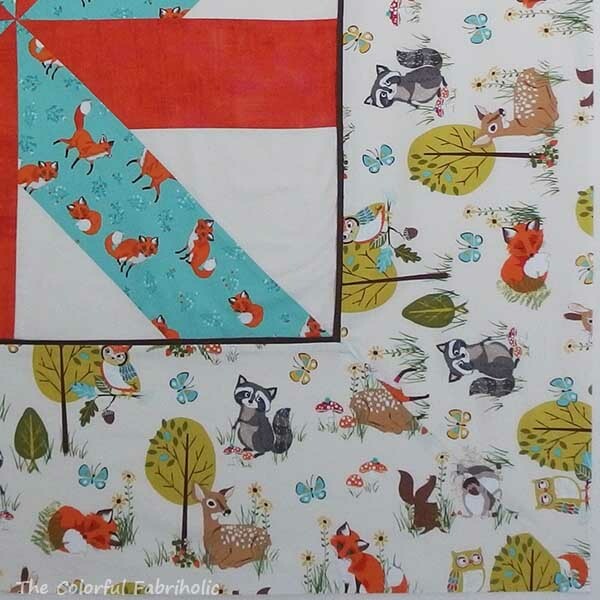 And I know mom will adore the cute Forest Fellows (Robert Kaufman) print. Last week I mentioned I'm piecing a top for Heart Builders and due to a screw up on my part, it would come out much larger than the allowed maximum measurements. You can see the story here. I used almost every inch of the cute honeycomb print they sent me. 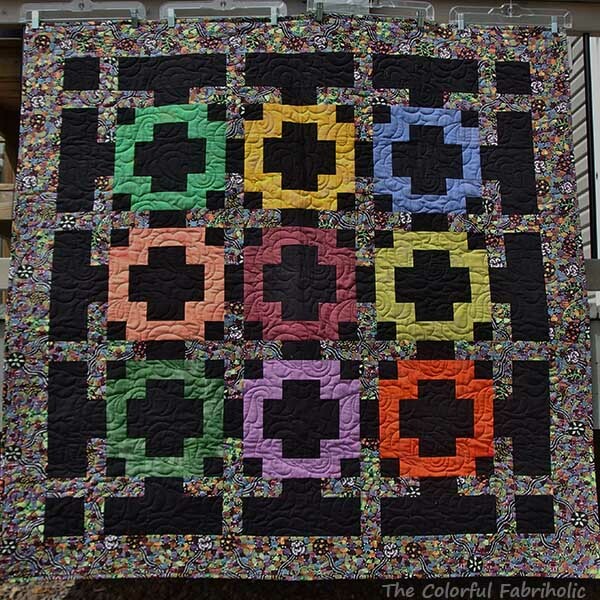 I had 16 blocks plus sashing, which made the top come out to 63 x 63". The maximum allowed size is 54 x 60". 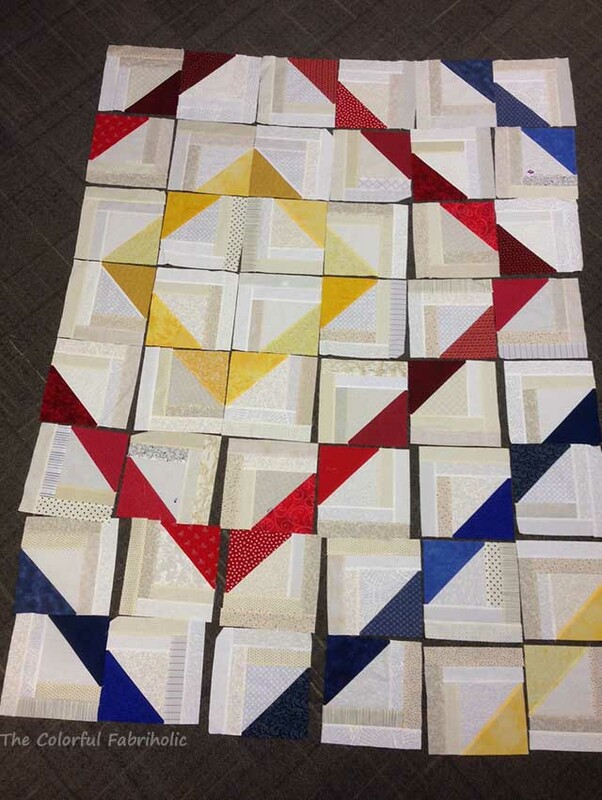 My solution was to make two tops, each a nine-block layout with sashing, measuring 48 x 48". I finished one top, and had seven blocks left over. 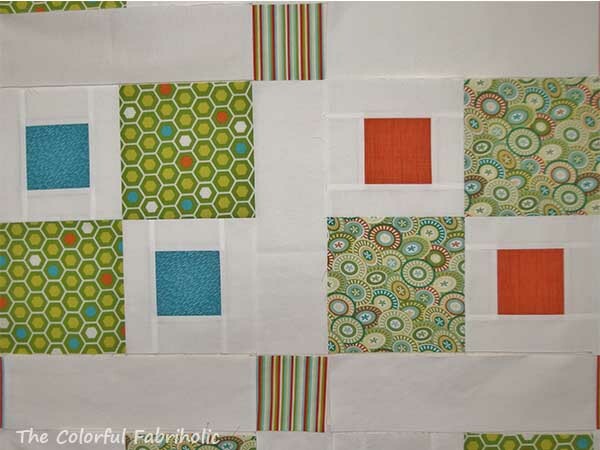 Not enough for the second top, but maybe I could find another print in my stash that would harmonize, and use it for the rest of the blocks. I found a print that works, the parasol print. It's a bit more sophisticated, but colorwise it works, and when all the blocks are together the sophistication doesn't matter. This week I need to get the second top sewn together so I can get them both mailed back to Heart Builders. If you're not familiar with Heart Builders, it's sponsored by Stash Builder Box, and it's quilters who piece tops, or long-arm quilt, or bind and finish quilts for kids. The quilts are donated to My Stuff Bags which are given to kids in foster care. Each bag contains a blanket and personal items that are theirs to keep forever. Starting off August in the right direction! 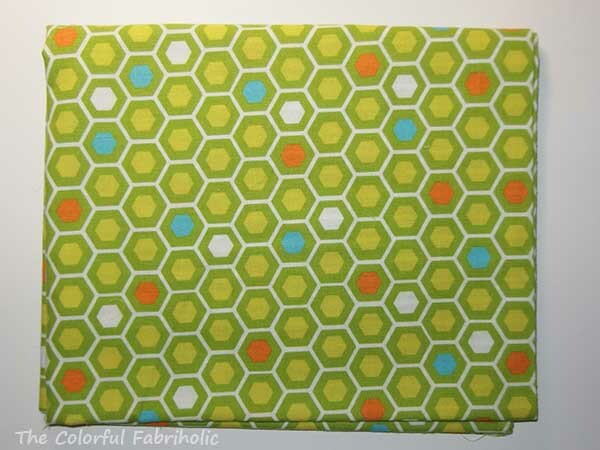 Out: 1-7/8 yards wide backing and 5/8 yard binding for PAussietivity. I'm hoping for some finishes and some good stash usage numbers this month. 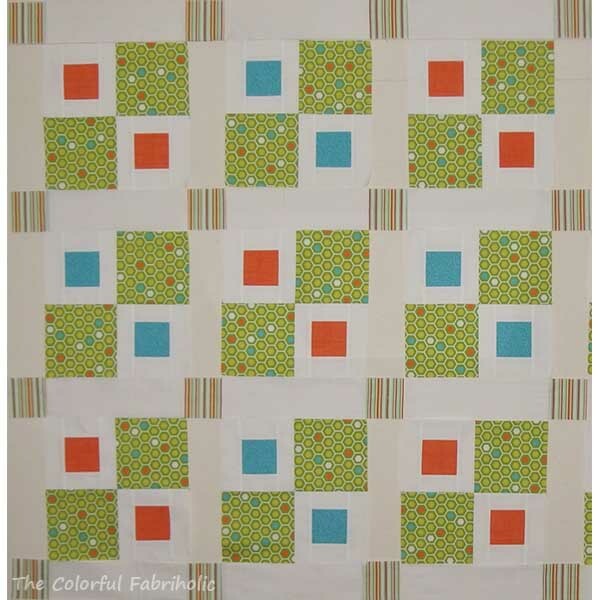 First, I need to get the Forest Fellows baby quilt done, quilted and bound. Second, I also need to get the two Heart Builders tops finished and mailed out; I'll only count the fabric I used from my stash for those since Heart Builders sent me two yards of fabric to work with. 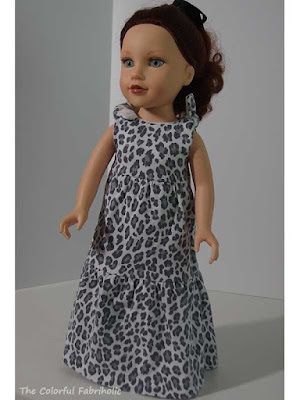 Third, I'm working on a secret sewing project that has to be done to the flimsy stage by the end of the month. That should keep me busy and use up some fabric! 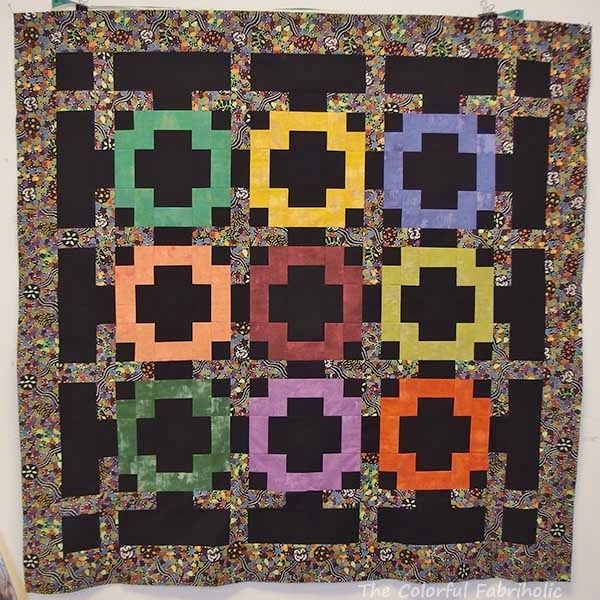 My Aussie fabric version of Positivity from Cut and Shuffle Quilts is finished! 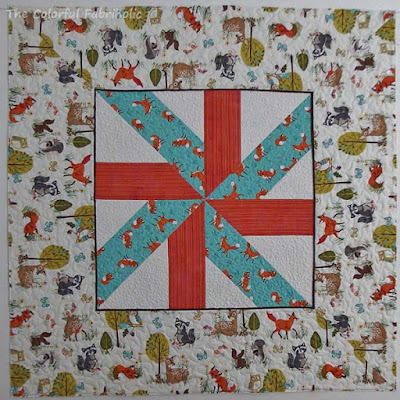 It will hang st The Quilted Fox as a sample for my upcoming class. 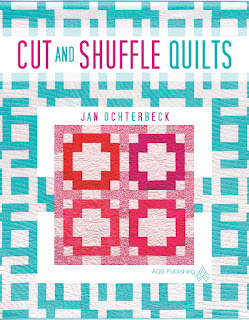 I'll be teaching the blocks from Cut and Shuffle Quilts on Nov. 5. I just love this Aussie print, but as you can see, I changed out some of the wimpy accent colors for stronger ones. Here's the original Positivity. 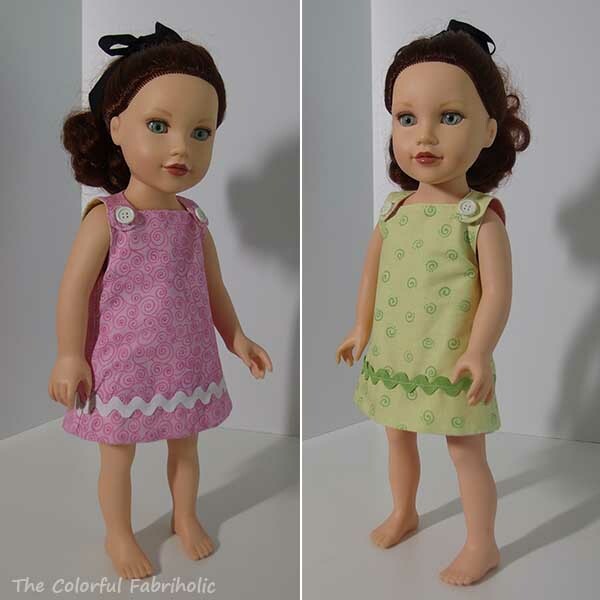 What a difference color and fabric selection make! Positivity and PAussietivity use the Plus block from Cut and Shuffle Quilts. Very easy, and a fun method. 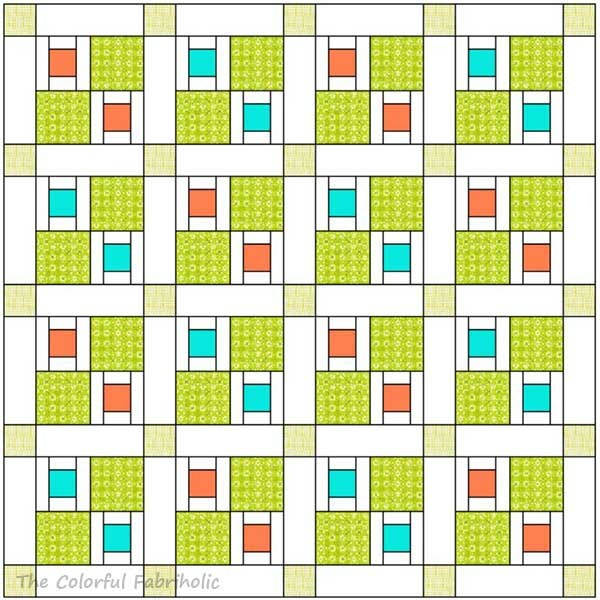 Start with a framed square, cut it up, rearrange the parts, and sew it back together nine-patch style. 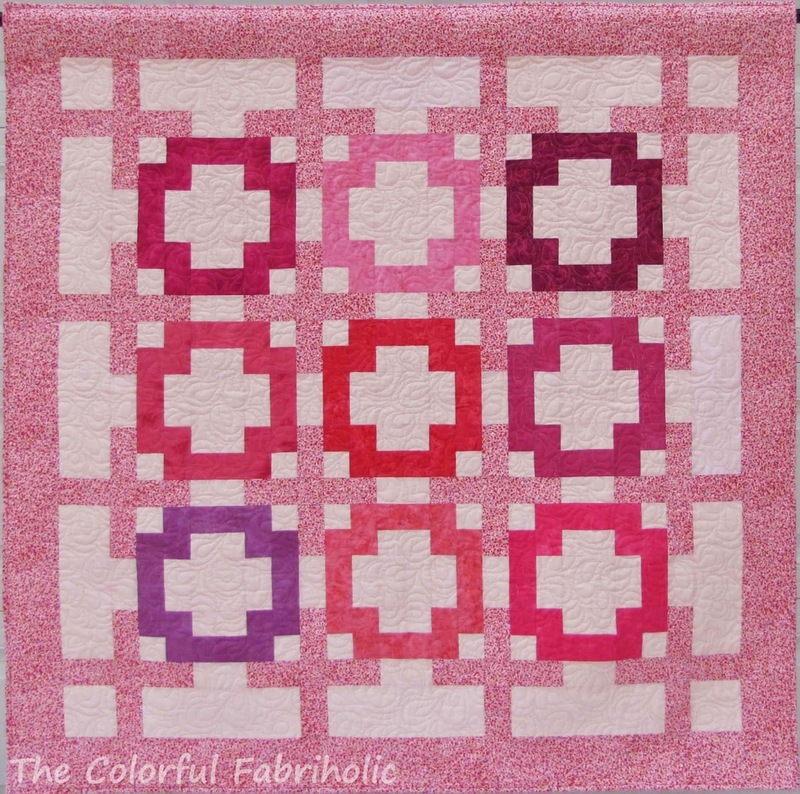 If you're in the St. Louis area and you'd like to take the class, sign up at The Quilted Fox. 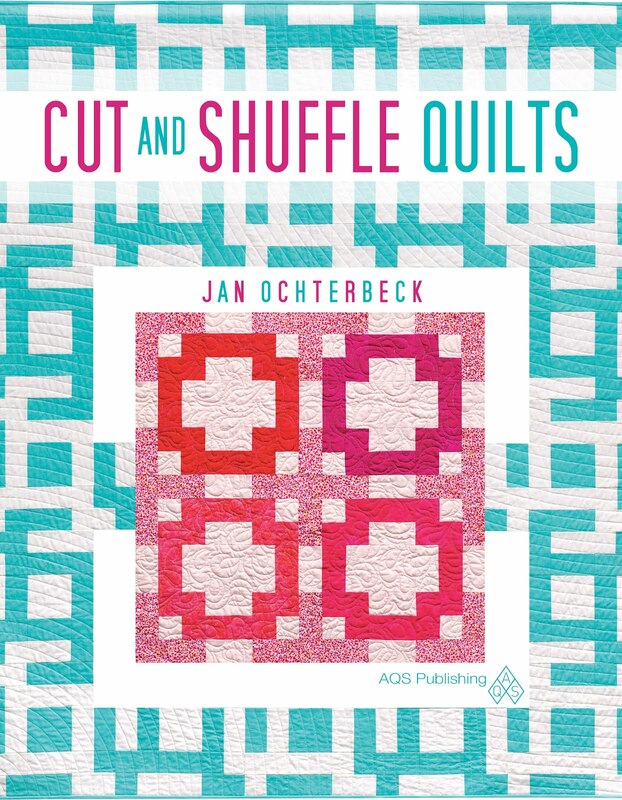 If you're elsewhere, Cut and Shuffle Quilts is still available from AQS or Amazon, but I don't know how much longer it will be available. 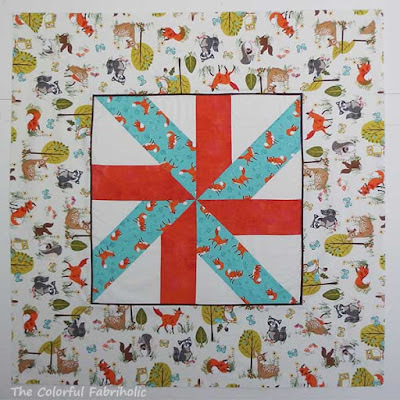 I need to get this Forest Fellows quilt finished this month. 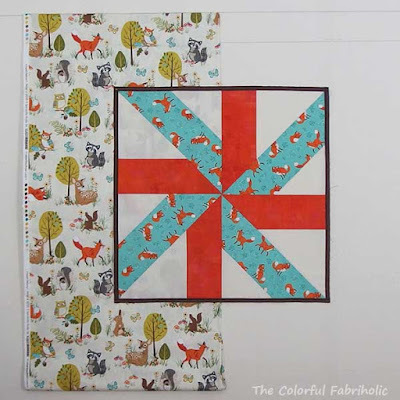 Then I'll need to plan for yet another baby quilt, because my nephew and his wife are also expecting, and I'll have to get that child's quilt done by November. Including my grandson, that will make five little boy cousins born since Sept. 2014. Good thing I like making baby quilts! Getting this Forest Fellows quilt finished is my priority goal for August, so I'm making it myOMG and linking up with Heidi at Red Letter Quilts. Of course I have lots of other projects on my plate, including the Heart Builders top I mentioned Monday (scroll down to Monday's post), and finishing PAussietivity, which is due at my LQS on Friday, and working on a secret collaboration with Alycia for later. I guess August will be a busy month. Let me show you what's on my design wall today and then I'll explain what the problem is. I signed up to be a top piecer for Heart Builders. 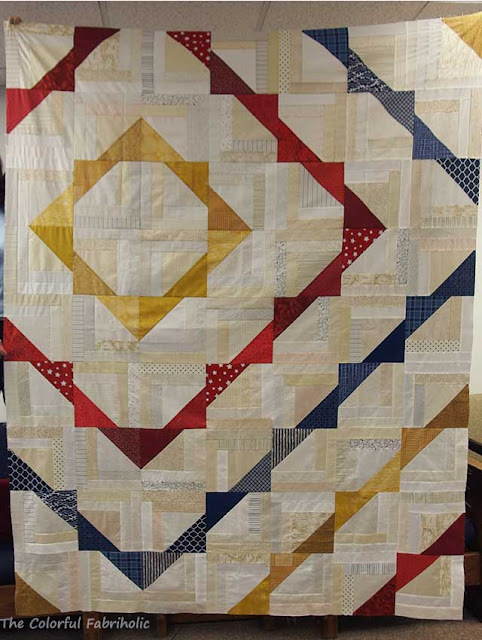 Heart Builders, sponsored by Stash Builder Box, are quilters who piece tops, or long arm quilt, or bind and finish quilts that go into My Stuff Bags which are given to kids in foster care. 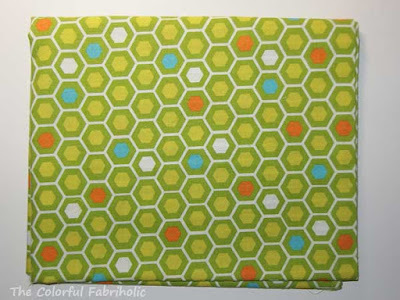 Heart Builders sent me a yard of this cute honeycomb print and a yard of solid white. Unfortunately I did not realize until I had all the blocks made and on the wall, and all of the sashing cut and most of it on the wall, that there is a size problem. The quilt on the wall will finish at 63" x 63", definitely not within the My Stuff Bags size requirements of less than 54" x 60". Yikes! How could that have happened??? Well, it seems I didn't change the block size in the EQ Layout screen to 12". With the default 9" blocks this quilt would have finished at 51" by 51" which would have been fine. Now what??? I have 16 blocks that measure 12". 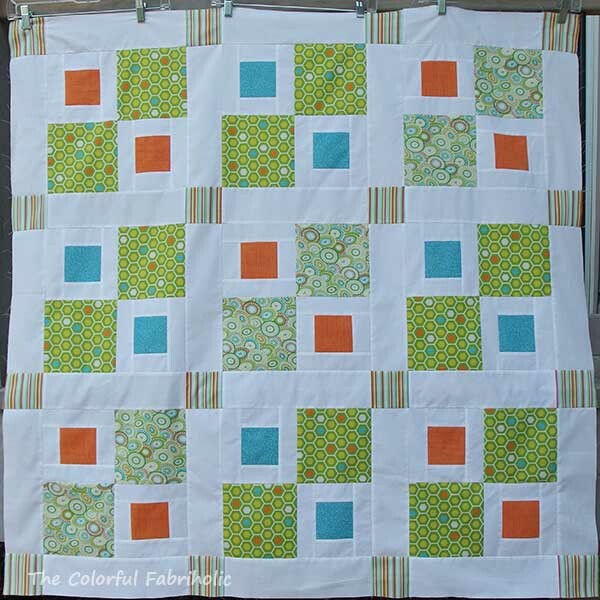 I have used all of the green print (in fact, the squares for one of the blocks had to be pieced together). I used all of the white they provided for the sashing, and I used more white from my stash for the blocks. 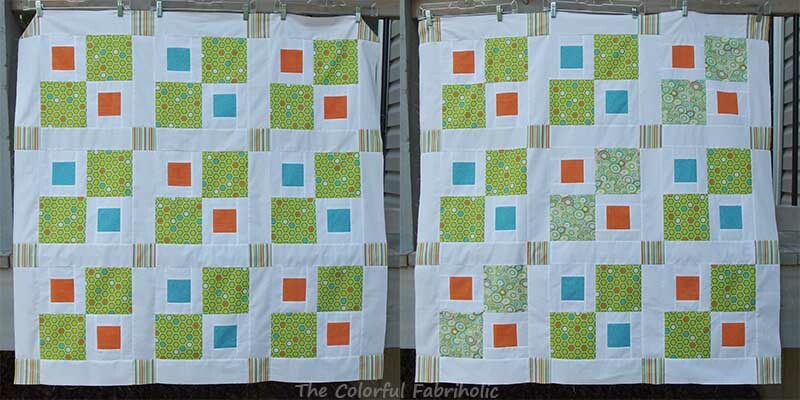 Here's the solution I came up with: Make two quilts. 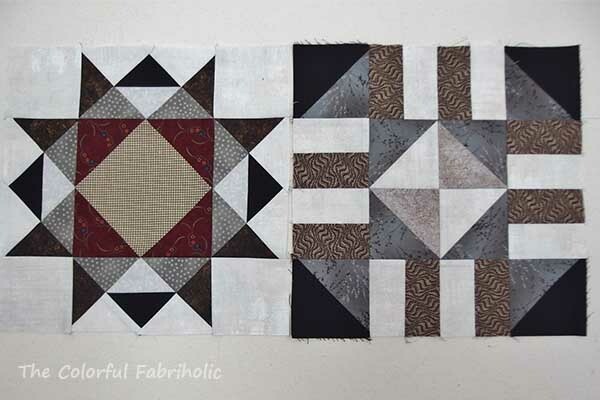 One will be a 9 block layout using the original blocks, like this. It will measure 48" x 48". Nine Block Layout, 48" x 48"
That will leave seven blocks left over. 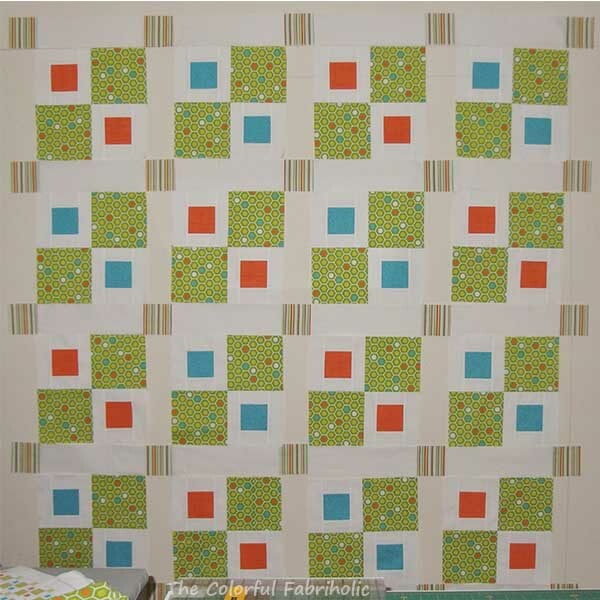 I have enough white, orange, blue, and stripe in my stash to make a few more blocks and sashing. 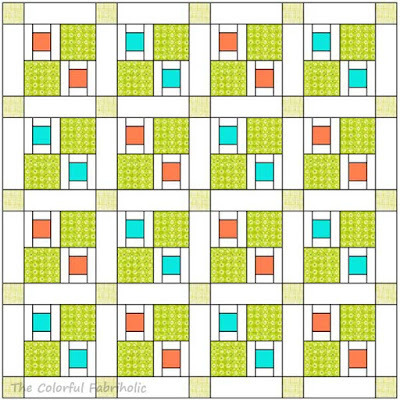 I'll find a harmonious green in my stash (or buy something) and make three more blocks. 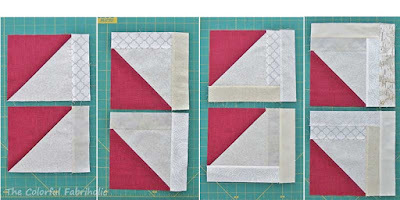 I'll use six of the original blocks and three new ones, plus additional sashing pieces, to make another top, same size and layout as the first. So, thankfully my careless lack of attention is not a disaster, and in fact will be a win for My Stuff Bags because they'll get two tops.